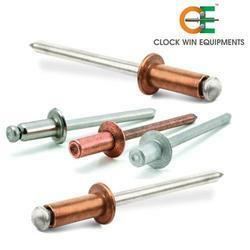 We are engaged in manufacturing BLIND RIVET and supplying a unique collection of Pop Rivet which are widely used for various industrial applications. 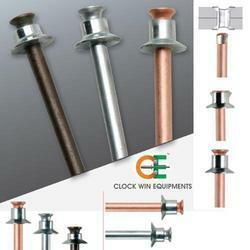 We offer these at economical prices and they are highly regarded as supreme quality products in the market. 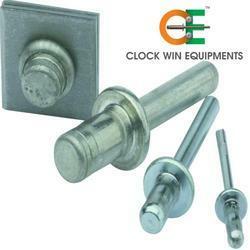 We offering these are customized as per the requirements of the customer. Some of the quality features are moisture resistant, longer service life and high tensile strength. From open-end rivets to high strength rivets, from general purpose to high clamp assemblies or from softer and brittle materials to thin sheet metal, POP blind rivets are available in a variety of styles. Whether you're designing aircraft, automobiles, appliances, truck trailers, HVAC systems, overhead doors, lighting, ceilings, personal watercraft, or RVs, POP has the rivet for you. 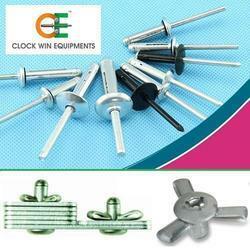 Our company is a content manufacturer, supplier, exporter, wholesaler and retailer of Pop Rivet. Known for its durability this product gains the attention of consumers. We, with extremely qualified individuals in their domain, produce the corrosion free pop rivet, which is valued by all our customers. This product provided the advantage of spreading load during the setting process. This prevents the material from the buckle. Length range: 0.197" to 0.984"
An exclusive Closed End Rivet design, this rivet type incorporates a unique cup-shaped end configuration that seals tight, preventing passage of vapor or liquid around or through the set rivet.In addition, POP closed-end sealing rivets provide up to 23% greater tensile strength than equivalent open-end rivets. Finally, these closed-end rivets provide 100% mandrel retention, which can be an important factor in applications such as electric and electronic equipment. Grip Tite Rivet provide exceptional mandrel retention and an impressive expanded footprint on the blind side. These rivets feature strong, vibration resistant joints. Ideal for thin sheet metal applications and suitable for joining plastic and composite materials, Grip Titerivets will set with no material deformation. The wide blind side footprint expansion spreads the load evenly and compensates for irregular holes. With high shear and tensile strength characteristics, Grip Tite is widely used in many industries including automotive where assemblies are subject to demanding conditions. 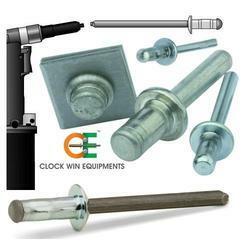 Features such as a large flange or countersunk heads, or stainless steel mandrel and specific plating can be customized to fulfill specific application needs. Grip Tite Rivets Expanded footprint for high strength performance through thick and thin. 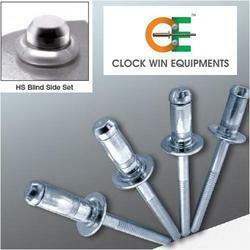 High Strength Rivets with large blind side expansion for structural applications. 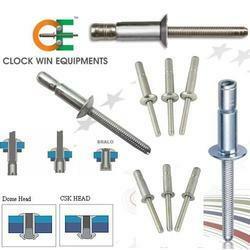 The high-strength blind rivet is a domed high-strength fastener designed to provide superior shear and tensile strength. Large blind-side expansion for structural applications provides vibration resistance and enhances joint integrity. 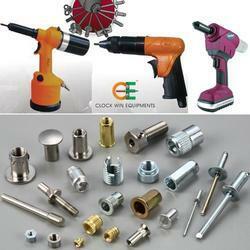 Used widely in the transportation industry where noise and vibration reduction are requirements. RoHS-compliant and manufactured to ISO, QS, and TS requirements. Load Spreading Rivets are designed especially for plastics and other brittle or soft materials, with a secondary head that forms large "folds." This provides a larger bearing surface that resists the pull-through or cracking that can occur in some materials with a standard rivet. This range of aluminium rivets with aluminium mandrels is designed to offer two particular advantages in joining soft, friable, or brittle materials. Its controlled setting gives outstanding reliability and produces a neat, uniform appearance. LSR rivets are perfectly suited to plastics, wood, GRP, laminates, and thin-gauge materials. LSR rivets have an important role to play in applications including the assembly of mobile homes and park homes, installation of plastic-framed windows, and the manufacture of plywood furniture or timber products such as trailers. Micro Rivets are inserted and set from one side of the work piece. 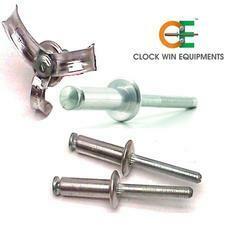 They deliver low in-place cost and fast assembly. Correct setting pressure is predetermined by the rivet design so sets are uniform and independent of operator judgments or tool torque. They are not subject to strip-out and will not deform work pieces. 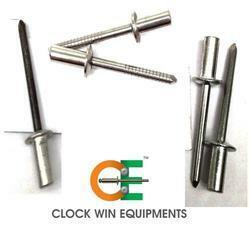 Open End Rivets pre-assembled onto a headed pin or mandrel, POP open-end rivets, when set, resemble conventional tubular rivets. Unlike tubular rivets, however, the mandrel head is retained within the body of the rivet. 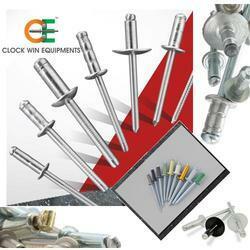 Pull-Thru PT Rivets where clearance is limited and a flush set are required on both sides of the application. The PT rivet is best used in the assembly of any product where clearance is extremely limited and protrusion of the rivet body from the application surface must be either minimized or eliminated. As the PT rivet sets, the mandrel head remains integral with the mandrel, assuring no loose mandrel heads in the assembled product. These features and benefits make the PT rivet unique in the marketplace. PT rivets are widely used in the electronics industry where space is at a premium but also lend themselves to many low-clearance industrial applications as well (see chart below). Blind side protrusion: < 0.4 mm/0.015"
Almost identical in appearance to our regular Soft Set Rivets incorporate a body and mandrel of the special soft aluminum alloy. Breaking at a lower tensile point than regular mandrels, they afford a firm grip but provide the more moderate pressure essential in fastening some of the more brittle materials. Designed for structural and similar high-strength applications, POP Tri Fold Rivets have exceptional pull-up properties and provide tensile strength up to 1100 pounds and shear strength up to 2400 pounds. 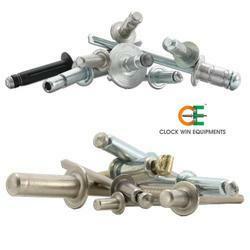 Interlock Multi Grip Structural stem fasteners providing a fully sealed, vibration-resistant joint. The Avdel Interlock rivet is a multi-grip structural break stem fastener with excellent hole fill to give a fully sealed joint. The Interlock rivet can close large gaps and prevent sheet movement whilst the high shear and tensile strength enables the use of fewer Interlock rivets per assembly.